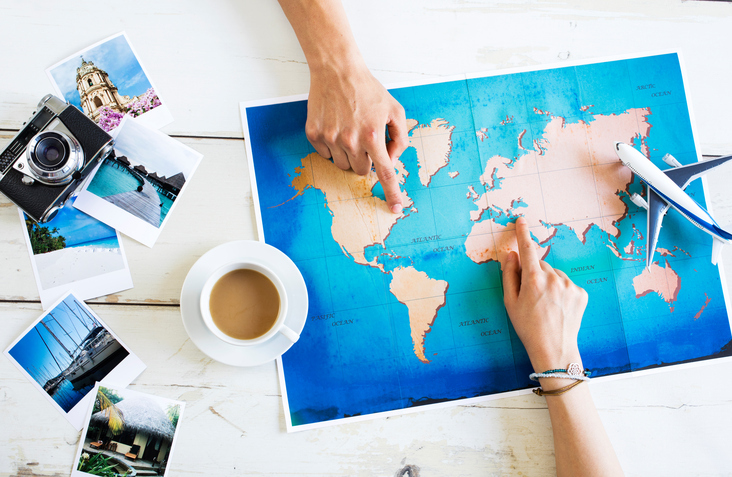 With limited choices for foreign transaction fee credit cards on the market right now, one great alternative to cash while traveling is having a prepaid Visa that carries the currency you need directly on the card. Even better would be a card that can hold more than one currency for you. For people who travel often and stay up to date with the fluctuating exchange rates, the CIBC Air Canada AC conversion Visa Prepaid Card could be beneficial. How? This prepaid Visa credit card could provide a safe and simple way to get a guaranteed exchange rate without worrying about changing rates. This means you get to save money and avoid pointless visits to your local bank. The obvious benefit of the CIBC AC Conversion Card is a simple fact it’s one card that allows you to store multiple currencies. You can move the funds around as you please, so you’re never stuck with a single currency. Since you pay the exchange when you load your cards with funds, you do not pay any foreign transaction fees when you make your charges. If you are trying to make a purchase in a currency that is not one of the above-supported currencies, then your card will also follow the priority list above, starting with any Canadian funds loaded to the card. Every currency after any Canadian Dollars that need to be used to cover your purchase will first be converted into Canadian Dollars and then used until the amount has been paid in full. 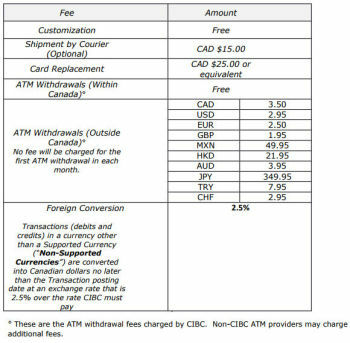 While this card does give you unlimited ATM withdrawals inside Canada when traveling outside of the country it only allows you one free international ATM withdrawal monthly. Depending on which currency you’re withdrawing, you’ll pay about $2.50 – $5 per withdrawal to CIBC, PLUS any fees the local ATM may charge. It’s important to note that with non-supported currencies, you pay the standard 2.5% conversion fee. 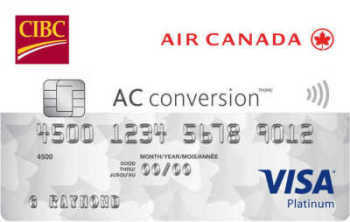 Before getting your CIBC Air Canada AC conversion Visa Prepaid Card, you need to have one of the supported currencies on hand (other than Canadian Dollars), to initially load your card. Once your card and account are set up, you can load your card with any of the 10 supported currencies. To do this, you just need to log in to acconversion.cibc.com and use your account’s online dashboard. Exchange rates are not final until the transaction is completed and the exchange rate you are given will be shown to you before finalizing your transaction to ensure you get the best possible rates. Overall, I think there are better options out there, but I admit this card will work fine for many people who travel frequently. If you could lock in some of the better exchange rates on the market, it could make this card worth it for you. But, if minimizing fees is your goal, you may want to take a look at a credit card that has no foreign transaction fees. If you’re interested in applying for the CIBC Air Canada Conversion card just click here. Don't subscribe All Replies to my comments Notify me of followup comments via e-mail. You can also <a href='https://www.creditwalk.ca/comment-subscriptions/?srp=5231&srk=2648578ecea05c83754707575dc5a494&sra=s&srsrc=f'>subscribe</a> without commenting.